Hello all! 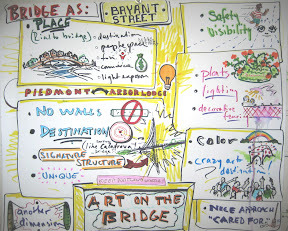 The Bryant Street Bridge (BSB) committee wants your feedback on the designs submitted. The BSB’s design page is HERE. Or you can jump right to the designs HERE. If you are a GMail/Picasa user, you can leave comments right below the pictures. Otherwise, comment below please. If you have questions, ask away!! This entry was posted in Transportation and tagged Bryant Bridge by Noah Brimhall. Bookmark the permalink. >I like the idea of a LARGE mural-esk sign on the sound wall at both approaches with HUGE arrows advertising and directing folks to the bridge.Also, I agree with the comments I’ve seen elsewhere that the posts along the sides of the path are a bad idea. The wider we can make the path the better. Perhaps make use of the pavers that allow plants through on the sides of the path. win-win. greenscape AND space where the traffic can spill over on to if needed. >FYI: Our ODOT grant $ are being made available through N Portland Neighborhood Services soon. Currently we’re completing our master plan with before/after scenarios, and hope to start implementing those ideas this fall. And of course we’re trying to keep the skills, resources, and dollars within our community We’re hoping to get some opinions and input here so we can start building these enhancements. Please jump in! >I like the design. Especially the rusted metal panels and pavers with grass. Very nice.I have one concern:1) This is already a very secluded area. I am very aware of my surroundings when I travel over the bridge–for safety reasons. Regarding the design: the trees planned at the entrance of the east side of the bridge create an even MORE secluded area/feel. While I’m all for greening up the world, especially around I-5, I don’t think that I would feel MORE safe traveling over the bridge with it’s current design. Perhaps some lower growth vegetation?Thank you so much for all of your hard work. I can’t wait to see the final project. I know it will be gorgeous!